I'm scared to make my favorite foods. What if I screw them up? Then I'll have to forever live with knowing that I can't make my own favorite foods. Or, worse yet, I'll have to try over and over until I get them right...thereby embarassing myself with/having to consume numerous inadequate versions of what ought to be perfection. With foods I don't care that much about, I try them once or twice and if they don't pan out, oh well! But the favorites...well, sometimes it's less scary to just refrain from potentially ruining the mystique. I've never made lobster. I've never made gnocci. I've never made sushi, pear-and-gorgonzola ravioli, cinnamon rolls, baklava, or this particular warm goat cheese salad I have dreams about. And, until yesterday, I'd never made Key Lime Pie. Key limes, also known as Mexican limes and West Indian Limes, are much smaller than regular limes (called Persian limes) and have higher acidity and a distinctive flavor. They're ping-pong-ball-sized, thin-skinned, and seedy. And now apparently available at Whole Foods. It took about 15 of them to make half a cup plus two tablespoons of juice (I imagine they're juicier in the summer, even if they are imported). Mix together crumbs, sugar and butter; press into bottom and sides of 9" pie pan and bake at 375 degrees for 6 to 8 minutes. Place on rack to cool. Beat egg yolks until thick and light yellow. Add sweetened condensed milk. Stir in half of the juice until blended. Add remaining juice and blend in. Pour mixture into pie shell. Bake at 350 degrees for 12 to 15 minutes until set. Let cool to room temperature; chill and serve, garnished with whipped cream. ...it was pretty good...but let it be known that mine is not the idealized slice featured at the beginning of the post (see below). I still haven't mastered graham cracker crusts...any tips? Mine always crumble when I slice the pie. It was very tart (no added sugar, plus the limes are out of season), but I like it that way, and the whipped cream offset it nicely. It wasn't rubbery at all - which is great, a key lime pie should be creamy, and creamy alone - but it wasn't quite light enough...a little dense and thick. Didn't fill up much of the crust; somewhat flat. Should I have beat the yolks with a mixer? What gives? So all in all, it was pretty good - Jeremy insists that he likes it better than 7A - but not the slice of heaven I was hoping for. Now, the challenge: I'm on the hunt for the BEST KEY LIME PIE RECIPE. Who's got it? Bring it on. I want to make your pie!!! Mine was pretty good, but I'm not sure how to improve it. That said, I'm (*sigh*) ready to try it again. Suggestions? Mix the sweetened milk with the lime juice in a large mixing bowl. In another bowl, whip the egg whites until you find you can almost turn the bowl over without them falling out. Add the egg whites to the bowl with the milk mixture. Mix slowly with a whisk so as not to deflate the whipped whites. Pour the mixture into the pie shell and freeze. Serve sliced and topped with whipped cream. Can't hurt to try. It's easy and you know how we always loved the Mucky Duck! It's frozen? weird. i'll try it! maybe try making the filling with a lime mousse instead of a curd? First, I'd try an 8-inch crust for that amount of fillling...judging from the photo. In my own classic recipe I use 3 large egg yolks, and 3/4 cup Key lime juice, with 3 teaspoons lime zest. I tried a recipe as follows: 3 med. eggs, separated. beat the egg yolks with a mixer (unless you have a farm arm. follow your instructions. beat the whites with a pinch of cream of tartar and up to 1 tblsp sugar until thick and shiny. whisk 1/2 egg whites into egg/milk/juice mixture, then fold in the rest. then your instructions for baking. For a deep pie, I like the 8 inch pan. And I love the idea of the lime zest. This should lighten it up a bit. 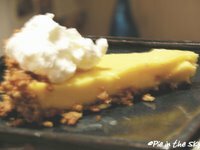 As much as you excite others about food, and as excited as you are yourself about sharing your fab ideas to the joy of us all, I 'll just bet you can get a good fare to Anna Marie Island to DIE for the most esquisite key lime pie in all of Florida. Here is key lime pie heaven. . . the Rod and Reel Pier restaurant!! OMG! Oh I am so happy that I found a fellow Key Lime Pie fanatic!!! I also have been on the hunt for the best pie and thought I had found it at the Mucky Duck. I am so happy to find the recipe on your blog!! I'll make it and let you know how it turns out. i made the mucky duck pie recently (the frozen one)...it was good, but so different than regular pie that i'm inclined to feel that it's a totally different food...good luck!